Using sending conditions with your automatic campaigns, you can configure when JungleMail for Office 365 should be sending a campaign. If certain conditions set by you aren't met, a campaign wouldn't set. For example, if no recent news is found in your Office 365 lists, the campaign would not send. In this tutorial, you will learn how to add and use sending conditions. 1. 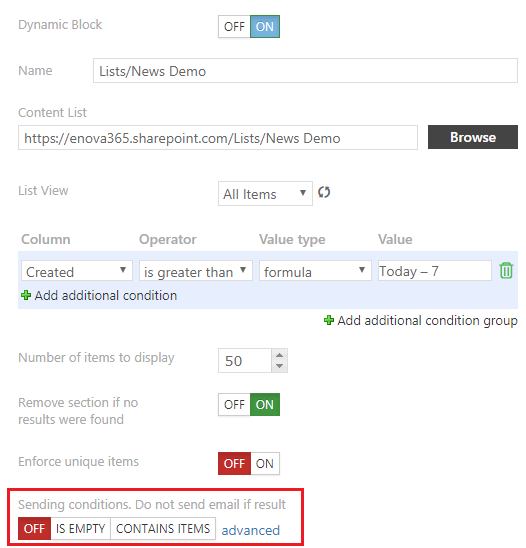 Go to the Dynamic Block you inserted and scroll down to Sending conditions, select the option you want, or select advanced for additional options. 2. After you have clicked advanced a popup window will open. Here you can select what you want to happen when specific conditions are met.